Nous avons été très satisfaits de la location et avons aimée. Nous avons passer un agréable séjour à ALCOSSEBRE, pour la deuxième fois, une ville très familiale et calme avec de belles petites plages, beaucoup de restaurants et de commerces, pas besoin de la voitures. L’ideal Pour se reposer et profiter des activités proposées. Le propriétaire Mr Terry que nous avons eu plusieurs fois par mail, est très sympathique et disponible. Mme Cathy et Mr Clive, le couple s’occupant de l’accueil sont très disponibles aussi. Malheureusement, nous avons dû écourter notre séjour pour des raisons personnelles. This was our third time visit to the apartment and ones again we had a nice and peas full holiday in Alcossebre. We are a family of 4 and therefore the quite large apartment and the two bathrooms are very comfortable. The apartment has a lovely and large balcony with a beautiful view over the harbor. In fact, the arear suits us perfectly. 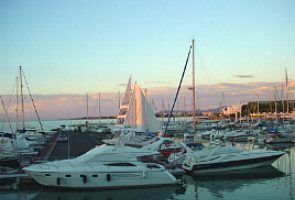 Walking distance to the city, very relaxed atmosphere, with some very good and cheap restaurants (needs reservation), and the beach just next to the apartment. We intent to return to the apartment and we are also considering returning out of season. This is definitely a place We could recommend to a friend. Al I can say is thanks, this is exactly how we feel about the apartment, we will be refurbishing the kitchen this winter. Over 75% 0f our bookings are repeat ones. Mijn beoordeling vindt ik nogal moeilijk maar de keuken is aan vervanging toe. Het appartement zelf moet eens goed schoongemaakt worden, stofzuiger en stofzuigerslang zitten met tape aan elkaar. Silvervisjes kwam ik tegen in de kleding kast. Krulspelden in de badkamer en etenswaren in de keukenkastjes ik kon mijn eigen spullen niet kwijt in de keuken kastjes. Privé spullen van de eigenaar kom je overal tegen boven op de kleding kast en schoenen in de kledingkast kleine slaapkamer. Overal stof in huis. Bezems en mop zitten vol met haren. Internet viel uit. pluspunt wel een mooi terras en je auto staat veilig. Jammer het dat alles zo verwaarloosd is. I would refer to today's review. I would comment as follows. Firstly, of the bookings we have had over the last year 73% were from people coming back for the 2nd, 3rd or even 5th time or being referred, so it can't be that bad, to the point that we will only be renewing our site add with one of the two companies we are currently with. > I am surprised that not one of these problems was mentioned during my telephone conversations with Richard about the internet. > Kitchen: Yes the Kitchen is looking tired and we have already decided that a total refurbishment should be carried out after the summer rush. > Cleanliness: We were in the apartment up until a week before Gerda and Richard arrived. Kathy and Clive carried out their normal cleaning routine (perfectly acceptable with every other client) but this is a Marina apartment near the beach and it does get dusty. The Vacuum cleaner will be replaced. > Food in cupboards: anything left there were products that most people are grateful not to have to buy, tea bags, sugar, salt, vinegar. etc We have given Kathy instructions that in future all things should be thrown away. > Personal belongings: We do have a small cabinet above the wardrobe that we store our things in. It is always locked and I find it hard to believe that a couple take so much for a holiday in Spain that it doesn't fit into the wardrobe and chests. > Internet went down: We have not increased our prices to cover the cost of the internet but offer it as a service, this is the first time in two years that we have had a problem with the server, but it was unavailable for a few days which was totally outside of our control.